I attended the first #BirchBloggersUK breakfast on the 13th November 2014. Everyone who was chosen to attend received a goodie bag full of fabulous products. Since the Birchbox event I have been trying out the products, so I thought I would post a review on the products I got in my #BirchBloggersUK goodie bag. Check out the Birchbox website https://birchbox.co.uk. The first product In my Birchbox goodie bag was an Agave set. In the Agave set there is a smoothing shampoo, smoothing conditioner & healing oil. I have had a sample of the healing oil in my Birchbox before & its AMAZING!!! I’m so pleased I got to try out the shampoo & conditioner as well as a bigger sample of the healing oil. 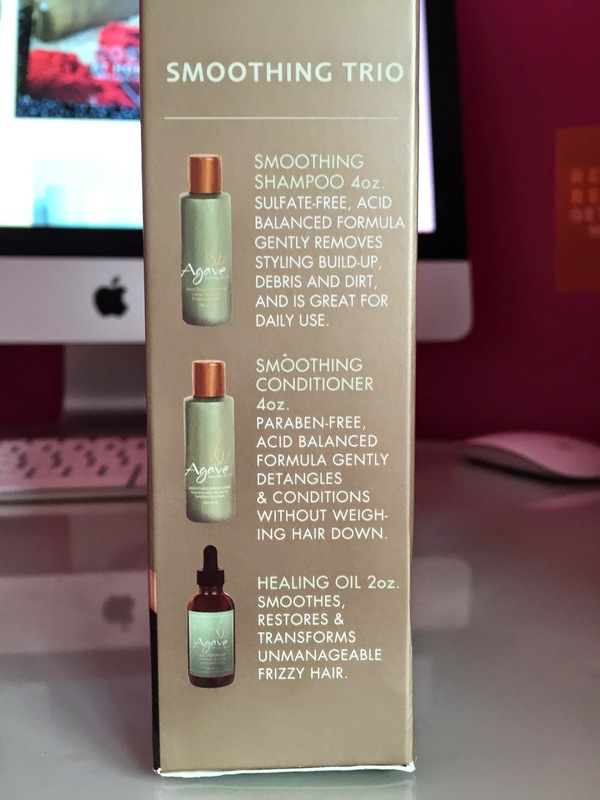 The Agave set costs £26 & you can buy the set from the Birchbox website https://birchbox.co.uk/agave-smoothing-haircare-trio. Agave smoothing shampoo is really nourishing & hydrating. The shampoo removes styling buildup, dirt & debris. The shampoo is safe to use on coloured hair & after you wash your hair with the Agave smoothing shampoo your hair is left looking sleek & gorgeous. The conditioner is great it leaves your hair moisturised and shiny. The healing oil is lightweight & didn’t leave my hair looking greasy which is brilliant. The healing oil defiantly tamed my frizzy hair & after using the healing oil for over a couple of months my hair is looking a lot healthier. The best part is that the shampoo is Sulfate-free & the conditioner is paraben free. I first found out about the brand Wild about beauty from getting an eye shadow sample in one of my Birchboxes last year. I had a massive smile on my face when I saw that I had a Wild about beauty eyeshadow in my goodie bag. Wild about beauty is a new make-up brand launched by an international make-up artist Kim Jacob & Louise Redknapp. Everything in the make-up line is free from parabens, petrochemicals & talc. My favourite thing about Wild about beauty is that the make-up is cruelty free. You can buy Wild about beauty eye shadows from Birchbox for £7.80 for a limited time. Normally Wild about beauty eyeshadows costs £13 https://birchbox.co.uk/wild-about-beauty-powder-eyeshadow-3622. The eye shadow colour I got in my goodie bag was called ’04 Becca’. Becca is a pretty neutral shade. I think the eyeshadow colour looks like a champagne warm brown colour. I think the eyeshadow is perfect to wear on a daily basis. Since getting this eyeshadow in November I have worn it nearly everyday. I love Wild about beauty’s packaging & I think the bee imprint on the eyeshadow is so cute. I have sampled quite a few Balance me products through magazines & beauty boxes. I was so pleased to get a full size Stellar beauty balm in my Birchbox goodie bag. The best part about the brand Balance me is that all the ingredients in the products are 100% natural. Stellar beauty balm is made from the most skin nourishing ingredients. Some of the ingredients include pure Vitamin E, Shea butter, Rose Oil, Carrot oil, Coconut oil, sweet Almond oil, Beeswax & Mango butter. Stellar beauty balm is soft & light & a little goes a long way. The Stellar beauty balm is going to last me for ages which is great. You can buy the Stella beauty balm from Birchbox for £18 https://birchbox.co.uk/balance-me-stellar-beauty-balm. The #BirchBloggersUK breakfast host was Jess Diner who is the new Editorial director of Birchbox. In the photo above Jess is on the left. The other 3 ladies are a part of the Birchbox team. Check out the latest issue of Look magazine. Jess Diner is in the magazine & there is loads of facts & information about her. Check out Jess Diner’s Instagram & Twitter page. Thanks for reading my blogpost!!! The Agave set looks really good. I may have to try it out. 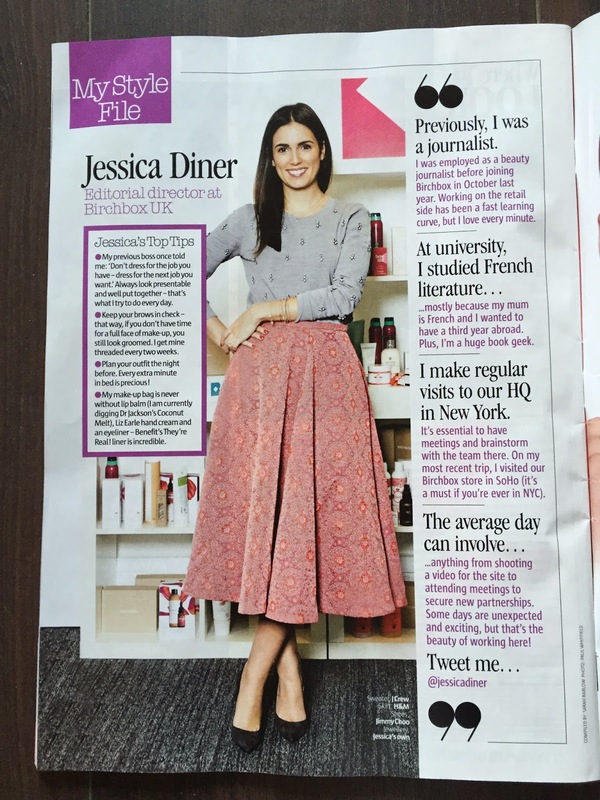 I love the skirt on Jessica in Look magazine!